The LiftActiv Collagen Specialist is enriched with pea biopeptides, natural mini-proteins that will boost the natural collagen production of your skin, plus vitamin Cg, which acts as a very powerful antioxidant to prevent free radical damage and pigmentation. 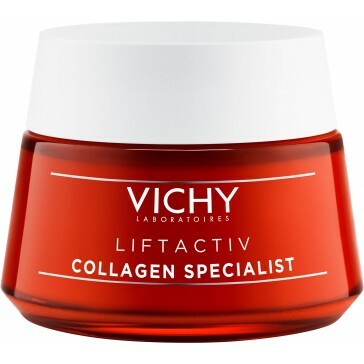 Added Vichy mineralizing water that will boost your skin’s defences, while Eperuline extracted from the bark of an Amazonian tree will reduce inflammation and protect against UV-induced antioxidant stress. Day after day, your skin will be revived and replenished while signs of ageing are reduced. Both morning and evening, apply a thin layer to clean and dry skin, avoiding the eye contour area.